Are you about to retire… or already retired? Then you need to read this important expose right now. Running out of money in retirement is the worst thing, short of death, that can happen to a person. And running out of money in retirement is the number one fear people have about retirement. Nobody wants to be stuck watching tv and eating day old food from the grocery store. Retirement is meant to be fun and exciting… it’s a time to travel, to learn, and to enjoy life… But if you don’t have money, you’re in for tough times. This free report shows you how to invest in dividend stocks to get a steady stream of income month after month, year after year. It could be one of the most important guides you’ll ever read. Simply sign-up below to get your FREE copy of this just-released report… and to receive our free Dividend Stocks Research newsletter. Now EXPOSED… Three Dividend Stocks for 2018 and Beyond! The first company is a huge player in the consumables space… and Warren Buffett owns a huge chunk of it. The second company is in a horrible industry… but they continue making money hand over fist… management can squeeze dollar bills right out of rock… and they pay a nice dividend! And the third company is one you’d never expect… they’ve been around for over 100 years, and have their fingers in thousands of businesses. Some people think they might rule the world! Get the names of the companies… and all the details on why they’re so great… right now… FREE! This is a limited time offer… these three dividend stocks are the perfect thing to buy in 2018. Get the report and all the details, it’s available now! Retire with confidence that you won’t run out of money in retirement. The secret is buying stocks that pay monthly dividends! That’s right, every month they’ll send you a check – a nice fat check. It’s like getting a paycheck in the mail every month. No need to budget, no need to worry about stretching your dollars. The monthly dividend check is the answer! 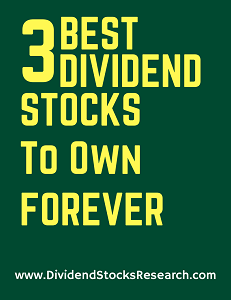 Our Free report “Massive List of Monthly Dividend Stocks” explains everything in detail!